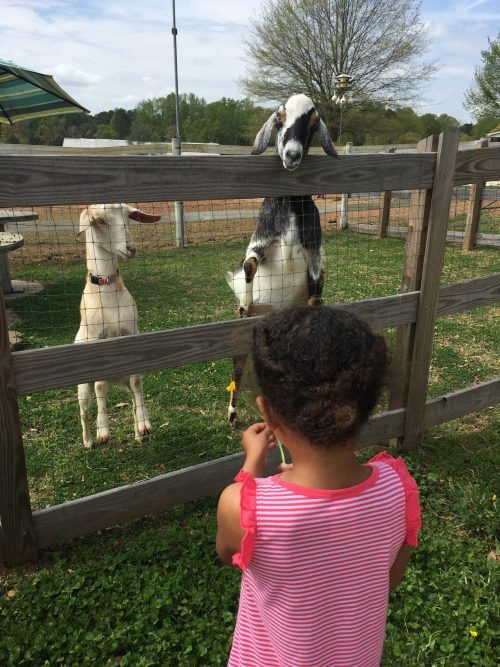 A couple of weeks after my family first moved to North Carolina, we visited Sweetwater Farm in Huntersville. Once a month they open their farm to the public. We went because we wanted to show Zoe and Riley where their food came from. The goats were very well fed that day. As a parent, I really liked showing my kids the source of most of their food. We live in the suburbs and don’t get to interact with farmers very often; I didn’t want them to think that milk came only from a grocery store. It was neat to say, “See that cow? That’s where milk comes from. And see those chickens? That’s where we get eggs.” Exploring the source of our food was a educational and meaningful experience. God is the ultimate source of all life. It is only in God that we can find our true existence. It can be all too easy to live life forgetting the source of our existence. Perhaps it would be helpful to repeat this phrase from time to time as a reminder of who we are. You have been intentionally sculpted by the hand of God. You are not a product of random chance. You have been created by a God who loves you. May you learn to live in light of this truth. May this reality deeply penetrate your heart. With every breath you take, may you be reminded of the God in whom we live and move and have our existence.